Black and white view from Bald Hill Lookout over Stanwell Park valley to Mount Mitchell, and the site of the Sea Cliff Bridge in the background. Stanwell Park is a picturesque coastal village and northern suburb of Wollongong, NSW, Australia. It is the northernmost point of the Illawarra coastal strip and lies south of Sydney's Royal National Park. It is situated in a small valley between Bald Hill to the north, Stanwell Tops to the west and Mount Mitchell to the south. It has two lagoons from the village's two creeks, Stanwell and Hargrave Creeks, and a beach running between headlands. Bald Hill is one of Illawarra, Australia's best known and most popular lookouts, situated atop the hill of that name. Not only are the views excellent, the area is also internationally known as a major hang gliding centre. This image belongs to the travel and nature stock photo library. This stock photo of Stanwell Park from Bald Hill Lookout is available for licensing for commercial and editorial uses including websites, blogs, books, magazines, brochures and advertising. Restrictions may apply for images which contain third party copyrighted material or sensitive subjects. Photos of artwork are for editorial use only. 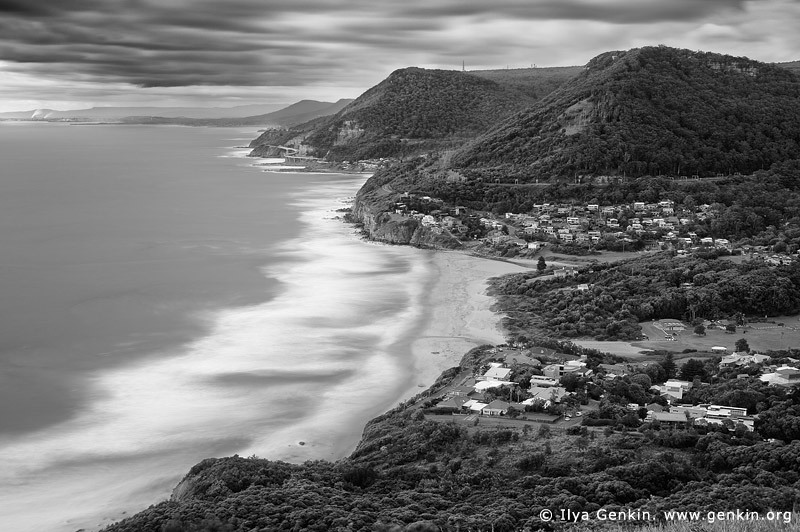 This image id AU-STANWELL-PARK-0001 of Stanwell Park from Bald Hill Lookout, is copyrighted © by Ilya Genkin. This is not a public domain image.